The Dr. Susan LaFlesche Picotte Memorial Hospital, late 2000s. Standing quietly on a hill in the northwest corner of Walthill, Nebraska, a small village on the Omaha Indian Reservation, is a 105-year-old hospital. The hospital bears little resemblance to contemporary medical centers. Only one-and-a-half stories tall, the American Craftsman-style building holds two general wards, a maternity ward, an operating studio, and five private rooms, in addition to a kitchen, an office, and staff quarters. When the hospital first opened in January 1913, however, it was a marvel: the first modern hospital on the Omaha Reservation, built without government support—financial or otherwise. Funding, supplies, and medical equipment came from public charities and private donors across the country. A benefit concert was held at Carnegie Hall to raise money for the new facility, and architect William Steele of Sioux City, Iowa, was brought in to draft its plans. 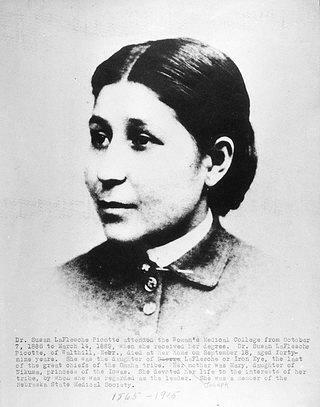 Remarkably, the entire campaign was the result of tireless crusading on the part of Dr. Susan LaFlesche Picotte—the first Native American woman to earn a medical degree, and the Walthill Hospital’s greatest champion. Raised on the Omaha Reservation, Dr. Picotte had dreamed of building a hospital for her people since her time as a medical student on the East Coast. Indeed, the reservation hospital is often described as the capstone of Dr. Picotte’s life—a final, monumental triumph after decades of spotless charity and advocacy. This, however, is only part of her story. The Dr. Susan LaFlesche Picotte Memorial Hospital, added to the National Trust's 11 Most Endangered List in 2018, in Walthill, Nebraska, circa 1910. Ironically, Dr. Picotte herself never worked at the hospital she helped realize. She died only two years after it was completed at the age of 50, following decades of chronic illness and disability that rendered her too frail to practice medicine in the final years of her life. Instead, the care the Omaha received from Dr. Picotte often occurred inside their own homes. Even when she was in poor health herself, Dr. Sue, sometimes accompanied by her two sons, would travel miles by horse and buggy to visit and care for the ailing, often cooking meals for her patients. 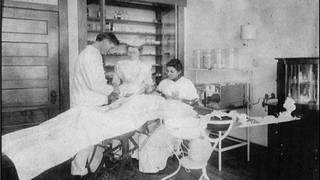 Her busiest months were usually during the winter, frequently brutal in the Midwest, but even then Dr. Picotte made herself available. The first true “hospital,” in fact, was inside her sister Marguerite’s garage, where the critically ill would receive more complex treatments, including surgery. 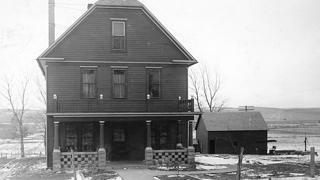 Later, following her own home’s construction across the street, Dr. Picotte’s basement served as the second “hospital.” For those she was unable to return to health, it also served as a morgue. Both of these structures—Dr. 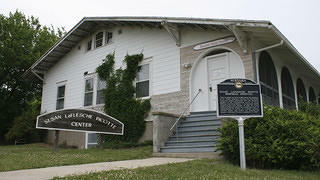 Picotte’s home and her sister’s garage—still stand. The home was only recently listed on the National Register of Historic Places, and the effort to include the garage in the 1988 nomination that resulted in the Walthill Hospital’s listing on the NRHP failed. Its history remains largely unknown to this day. Dr. Sue operating in Walthill, before the hospital was built. For those most familiar with Dr. Picotte’s life and legacy, the lack of recognition for these more humble structures is vexing, but not surprising. Ideally, OTHRP would like to see all three of these buildings be incorporated into a historic district, along with a hotel, jail, and several other properties in and around Walthill that date back to the turn of the 20th century. It is the hope of OTHRP that the development of a historic district would allow for a more comprehensive retelling of the period in Omaha and American history that shaped Dr. Picotte and her generation. Indeed, Dr. Picotte, renowned for her intelligence and work ethic, was no anomaly. Her father, Iron Eyes (Joseph LaFlesche), was a prominent leader during a tumultuous period in American Indian history when many tribal peoples, the Omaha included, found themselves swept up in the ferocious politics and unrelenting upheaval associated with American expansion. Although he never learned to speak English, Joseph LaFlesche came to believe that assimilation and integration were the only ways to ensure the survival of the Omaha people. All of his children, encouraged to pursue advanced educations, went on to carve out noteworthy places for themselves in their rapidly changing world. Rosalie LaFlesche Farley, the namesake of nearby Rosalie, Nebraska, partially managed the Omaha tribe’s finances, sometimes for her family’s benefit. Marguerite LaFlesche Diddock often gave speeches on behalf of an ailing Dr. Sue and later donated the land upon which the Walthill Hospital was built. Francis LaFlesche became the first indigenous ethnologist, writing extensively on his own life and people. Susan’s sons, Caryl and Pierre, both served in World War I. Caryl Picotte also served in the Philippines during World War II, where he was captured and spent 3 ½ years as a Japanese prisoner of war. Caryl’s son, unable to join the American military, enlisted in the Canadian military during WWII. 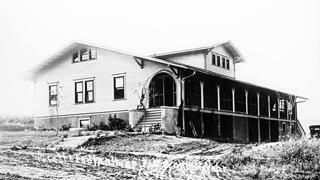 Dr. Susan LaFlesche Picotte’s home in Walthill, Nebraska, circa 1908. Dr. Picotte is not without controversy. Her missionary zeal alienated her from her people, and her ardent campaign for temperance, along with her disdain of time-honored Omaha medicinal practices, has complicated her legacy. The complex narrative of Dr. Picotte is reflected in the equally complex dealings surrounding the historic sites tied to her life and work in Walthill. The hospital where she never saw a patient stands as the most prominent monument to her legacy. Meanwhile, the significance of the nearby home and garage where ailing Omaha sought out the care of Dr. Sue for years is known to only a few. Today, the Dr. Susan LaFlesche Picotte Memorial Hospital stands vacant, but thanks in part to its 2018 inclusion on the 11 Most list, the Nebraska Commission on Indian Affairs (NCIA) received a $100,000 grant from the United States Department of Agriculture to embark on the hospital's restoration process. While preserving the Memorial Hospital restores only a portion of Dr. Picotte’s history, it marks the first step in a long-overdue process of adequately remembering all the places that reflect her legacy. This story has been updated to reflect recent changes to the status of the Dr. Susan La Flesche Picotte Memorial Hospital.